For those who have been following the Baroness saga, Purple is especially monumental. After their first three records, Red Album, Blue Record and Yellow & Green, the group were poised to be one of the most popular heavy psych and metal bands of all time. Then, a bus accident in 2012 that resulted in serious injuries derailed the group's plans, causing two members to leave the group and ultimately forcing the band to go on hiatus. But three years after that terrible crash, Baroness are back with a record that just may prove to be more powerful than even their earlier material. "It's shorter and it's more direct. 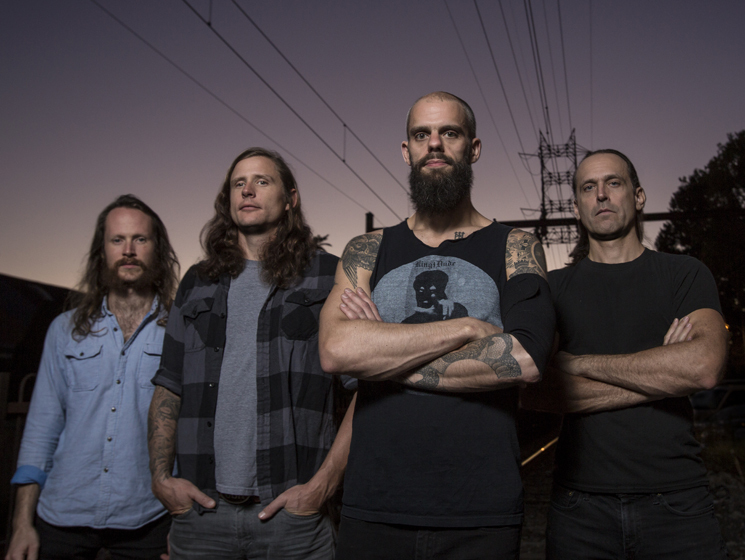 You can expect something much more energized and focused than the last record, intentionally so," Baroness vocalist John Dyer Baizley says of the upcoming Purple in an Exclaim! interview. "The actual process was rehabilitative for me and necessary — in that regard, this is very fully a record about the bus crash and a result of it, but it is important for me to note that the record is not directly about that. That's my perception of it, and that's the purpose it served for me, but there are two members of the band who were not involved in the bus accident, so for them, it is not about the accident." In terms of new members Nick Jost (bass) and Sebastian Thomson (drums), Baizley feels extremely fortunate that the group were able to find individuals who were such a good fit for the band's dynamic. Baizley explains, "It was really, really amazing — Pete [Adams, guitar] and I feel like we basically struck gold with those guys, because we didn't try anyone else out; they were two strangers to us and each other, and after a few months there was a huge bond inside the studio and out. We've been incredibly fortunate." While Baizley stresses that the recording process is different for every record, the group also have a method to generate creativity. "The process is usually music first, then lyrics, but sometimes it's not that way across the board — I try to keep everything as fluid as possible. When momentum slows in one place, it is important to pick it up somewhere else. We will transition to a new part of the song. I really do just try to let it happen." Purple arrives Friday (December 18) on the band's own Abraxan Hymns label. You can hear the newly shared "Try to Disappear" below, as well as "The Iron Bell." UPDATE (12/16, 3:30 p.m.): You can now also stream the whole album here on YouTube.